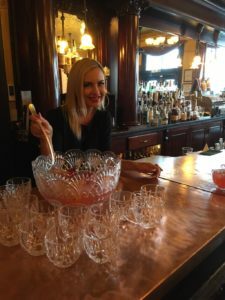 The Golden Era Lounge in Nevada City is thinking about hosting monthly “pop up” dinners — pairing imaginative dishes with craft cocktails and fine wines — and we joined a gathering of “friends and family” this week for a sneak preview. Since emerging over a decade ago, pop-up dinners have become one of the fastest-growing culinary trends. They remind me of the homey Sunday dinners at my grandma Clara’s house in the ’60s — but with modern scratch cooking (fresh and local, never frozen) and invitations blasted out on Facebook, Twitter and Instagram (not a rotary-dial phone). Our six-course dinner, lovingly prepared in Golden Era’s commercial kitchen by super-talented local chefs, was a big hit. Like all my favorite pop-up dinners, the focus was on the food and drink, the sourcing and ingredients — and good conversation. The Giardinas — Steve and Cindy and their children Eric and Jessica — are ebullient hosts. We sat at a long table, along with neighbors from Wheyward Girl Creamery, the Ham Stand, and singer Lorraine Gervais, who often performs at Golden Era. 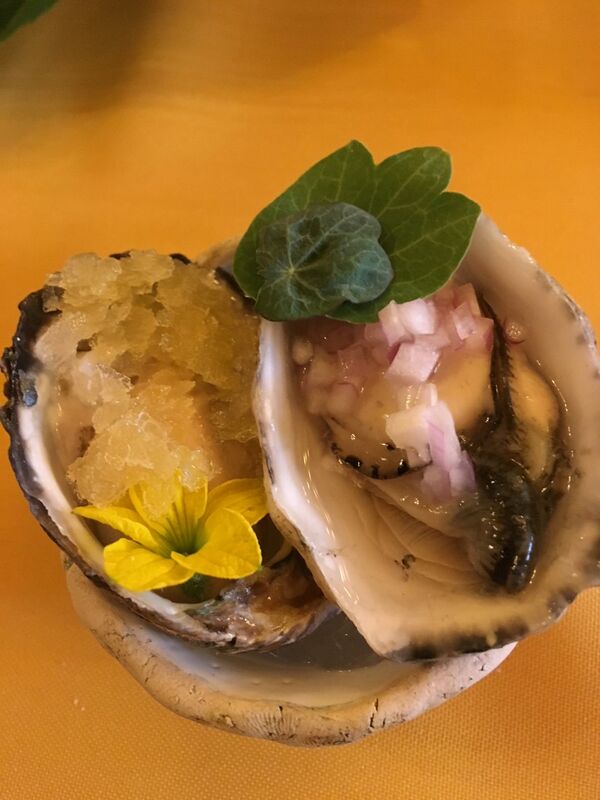 Golden Era’s foray into pop-ups is the latest example of a culinary renaissance in the foothills — at restaurants such as Twelve 28 Kitchen in Penn Valley, Stone House and Polly’s Paladar supper club in Nevada City, and soon-to-open Watershed in Grass Valley, among others. The dinner showcased our area’s local culinary talent. Local chefs Jesse Hanshaw and Kevin Soares, Rosemary Fisher and Tom Bevatori (Lorraine’s son), created imaginative dishes. Bartender and craft cocktail connoisseur Eric Giardina came up with some delicious drinks to go along the dishes— a growing trend. (Read how bartenders and chefs are collaborating in inventive, unconventional ways). We also enjoyed a house red wine from Avanguardia, thanks to the talents of winemaker Rob Chrisman. Some examples from the menu: fresh oysters (cucumber melon granita, brut rose mignonette), paired with “rose punch,” a light and delicious Mezcal-based cocktail; corn bisque and summer squash (tempura blossoms, shrimp, pickled squash, peppers, and greens, paired with a light Bloody Mary-like cocktail; and fresh-made squid ink linguini (mussels, preserved Meyer lemon, tarragon, radish and bonito) paired with “gold matter,” another light, refreshing cocktail. Avanguardia’s red or white wine was paired with fresh sturgeon (rye crumb, mustard aioli, tomato dill salad and charred broccolini); and dessert was almond cake (fruit and whipped creme fraiche), paired with “Sweet, Sweet Bliss,” an imaginative dessert cocktail. Thoughout the meal, Jesse, Kevin, Rosemary, Tom and Eric discussed and answered questions about the menu, including the sourcing from local farms. The melons, corn and fresh herbs came from Mountain Bounty Farm; the squash blossoms, microgreens and peppers were from Blue Dane Garden; the greens and green beans were from Fog Dog Farm; and the sturgeon is farmed from a pond in Elverta, Jesse told us. Eric is a craft cocktail expert. He travels regularly to Oaxaca, hosting tours of artisan Mezcal distilleries. The Golden Era is ideal for a special dining experience. The venue at 309 Broad Street harkens back to the Gold Rush era, with a decorative gold tin ceiling, chandelier, Edison lights, and polished wooden floors. A fireplace glows in one seating area, and a fresh rose adorns each table. The bar area is anchored by a Brunswick, Balke, Collender “Record” bar that was made in the mid-1890s in Chicago, and it has been in place since 1904. I’m hopeful that Golden Era will go ahead with the pop-up dinners. The monthly gatherings will compliment our dining scene, now on a roll and gaining attention throughout Northern California.